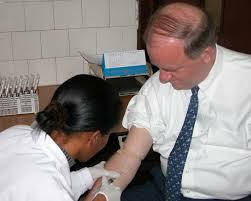 providing all necessary information at their 1984 and 1985 evaluations, to determine whether non-heated or less than 80 degrees C dry heat-treated partially purified factor products were associated with 1) the development of AIDS in human immunodeficiency virus (HIV)-infected persons or 2) abnormal immune test results in participants seroconverting or remaining HIV seronegative. We found no relationship between type of factor (VIII vs. IX) (n = 162), frequency of usage (greater than or equal to once a week vs. less than once a week) (n = 141) or yearly doses of non-heated or dry heat-treated partially purified factor (n = 118) and the development of AIDS. Seroconverting participants using partially purified factor products greater than or equal to once a week in 1984 had lower T-helper cell numbers in 1985 than those receiving factor less frequently (median 515 vs. 772/mm3, n = 9), as did those using factor greater than or equal to once a week in 1985 (median 515 vs. 726/mm3, n = 10). A similar relation was seen between 1984 frequency and 1985 T-helper cell numbers of seronegative participants (median 741 vs. 1037/mm3, n = 31). The yearly dose of heat-treated products was not associated with any immune test result or changes in results between years. These findings suggested that frequency of administration of partially purified factor materials may have had an effect upon the immune system, but that total yearly dose did not. Previously used partly purified, dry heat-treated factor concentrates were not associated with the development of AIDS.